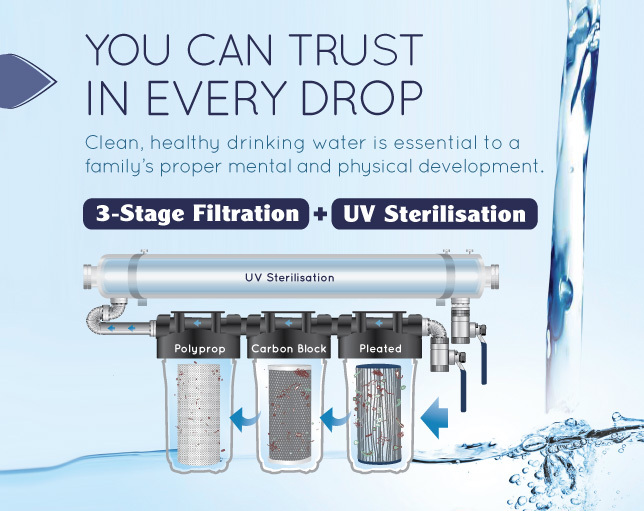 Filtermate builds a range of Whole House Water Filters to suit various applications and property sizes at their facility in Western Australia. All filter units are fully assembled and pressure tested prior to being shipped, are pre-mounted on rigid pvc that won't warp or rot, and are encased in an attractive weather resistant aluminium case for simple outdoor or indoor installation. Our water filters all include stainless steel fittings and guages, NSF approved Housings and Watermark approved valves. Our units with UV sterilisation also include stainless steel reaction chambers, Philips Germicidal UV lamps and advanced electrial ballasts with alarm protection. Our commercial unit comes with additional safety technology with optional shut off valves and Aquatrip leak detection system included. We supply a wide range of residential and commercial customers throughout the country and offer excellent after sales service. Specifically designed (without UV) for town supply water users who wish to remove chlorine, some flouride, etc from their drinking, shower, clothes washing, and cooking water supplies. Suited for smaller homes, holiday homes and people on solar power on rural water supply. Suited for all houses on rural water supply, who are dependent on rain water, surface water, river, lake or bore water. This is a made to order stytem for commercial clients who require additional safety features including automatic shutoff of water after failure of power or globe and/or Aquatrip Leak Detection device.